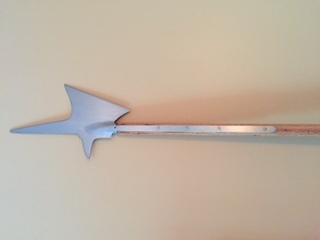 My wife picked me up a GDFB German Halberd head as part of Christmas and I finally got around to working on it. 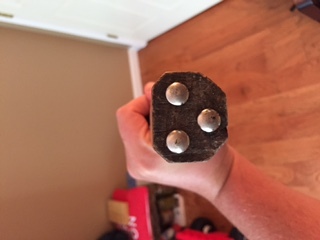 The head itself came in ROUGH shape, and the socket was very uneven. It needed a lot of cleanup around the edges, and I also had to clean the inside of the socket to try to even things out a bit. I had to give the langets a new "memory" as when resting, they touched about halfway down and all the way through to the end...and were not even either - several degrees off actually. No matter, I'm still new at the historical recreation scene and I'm looking for an education. It took some work, but it was worth it in the end. I like to keep my DIY projects (at least for now) pretty cheap - bargain basement in fact. The project in total cost me about $40 - just the price of the head itself (with free shipping) as I was able to source the other materials from things I already had. After cleaning up the head, it was time to shape the haft. Being unable to source ash at the lengths desired (7.5 ft) I decided to go with some red oak, which ended up being lighter than I first thought, and is plenty strong enough for the task. Though I know ash is the historically preferred method, I told myself that period smiths or haftsmen in my situation might have done the same thing - when your desired material is either unavailable or too expensive, go with another good option. I began by ripping the haft to uniform size on the table saw - 1 1/4 width; 1 3/8 depth; 7 1/2 ft. long. After the rough cut, I went on to finer shaping. I octagonalized the haft and then used a combination of surform tool and file to shape the head for the socket and to narrow down the haft closer to the top in order to decrease any stress on the langets where they join the head. After the shaping was finished, I applied some JB Weld to the socket, and down the length of the langets just for good measure. I used some bright nails from the hardware store and cut them off at half the width of the haft to create some langet nails. I also put JB Weld on the nail shaft before hammering into the pilot holes I had previously drilled. In order to make the nails a little less modern, I used the disc on my belt sander to create more of an angular shape and make them look a little more "forged." I chose not to place nails in the socket holes as the socket itself was rather thin and I didn't want to cause any splits or break-offs by trying to insert a nail. I tried cutting a nail head down to nothing and JB welding in place over the hole, but unfortunately it didn't stick. It's noticeable, but not something that bothers me too much - the head is definitely not going anywhere! Rather than make a buttcap for this piece, I decided to go with some furniture tacks on the bottom - 3 in total, just to give it a little ground clearance. I had previously read somewhere that this was a permissible solution for service grade weapons...but can't remember where. Lastly, I oiled the haft and it brought out some very nice grain patterns. The red oak I sourced for the haft was sawmill cut lumber that had been sitting out in the weather for 2-3 years. As such it had some tiny wormholes and other imperfections which ultimately ended being a nice complement to the "rough" forging of the head. Though I do eventually plan on taking the grinder back to it in order to give it some kind of edge (and bevel the spear point a bit), I'm pleased with how it turned out. A nice service grade weapon that looks like it's been on a campaign or two - not bad for a bargain basement DIY! Clamps applied after JB Weld and langet nails. Nice work with a lower end quality halberd head. On the plus side a lot of common pole weapons where not even heat treated according to Craig at Arms & Armour. I wonder if this halberd head is heat treated or not ? You could also do a patinated finish using the yellow mustard and or vinegar method. What works well for me is to use a paper towel and dab some yellow mustard on the steel, wait half an hour and clean off the mustard and repeat: You should get some etching and light pitting as well as the surface colour turning more or less grey. Very light sanding removes some of the patina but leaves a pattern of etching on the metal as if it had rusted a few times and then cleaned up repeatedly ..... you can leave some of the patina or bring it back to bright but now with some interesting surface texture and character. With practice one can get some control on what the finish looks like. Another option is to then also use some Gun Blue over the patina and either leave it fully blued or use synthetic steel wool with gun oil to lighten the finish .... one can repeat the process if one has removed too much of the bluing and patina. Red oak is a strong wood and not a bad choice for a polearm haft, maybe ash is preferable because it's more resilient and chock resistant ? Red oak may be a little harder ? I always enjoy seeing some good DIY work that makes for a great deal of improvement in looks, and sometimes also improvement n function. Nice work! The greatest bargains in this hobby are for folks who can do a little hacking! Thanks Sean! With each project I learn more and have more fun. Being willing to take a chance on some cheaper parts and pieces has actually served me well - as you've noted, there are some deals to be had for those not afraid to hack! 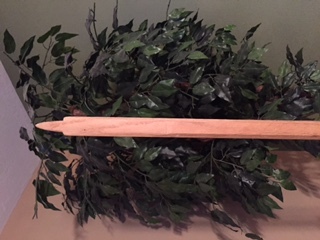 Next projects will be a pollaxe and maybe a shorter spear. I'm in love with polearms right now...and the supplies needed are not terribly expensive either. I did a little digging after an epiphany - and it turns out that I read about the tacks in an old post of yours - a spear project posted about ten years ago! Looks like you've aided me once again. On a separate note, (if you'll allow me to wax philosophical for a moment) the amount of historical info to be found on myArmoury is staggering. As an amateur historian and enthusiast, this site more than any other has aided me in developing both knowledge and a working skill set for arms and armor of the time period of my interest. I would imagine that historians, and aspiring ones alike, could benefit greatly from this community. Thanks Jean! I appreciate the tips - a "cloudy" patina might go well with this piece. I fell in love with red oak all over again while working with it on this project. It has beautiful grain patterns and doesn't put up a huge fight in the shaping process. I know that ash is harder, but just slightly. During my research, I learned that the weight difference between the two is negligible or near the same - both register at around 42 lbs/ft3. I live in the foothills of the Appalachians here in East Tennessee and for centuries local craftsmen have used red oak and ash almost interchangeably for things like cabinets, doors, and moulding. Here in our area red oak is more available, though it may be less so and more expensive in other areas of the country. So the woods have similar properties for woodworking and are very close in weight and density, hence one of the reasons I chose it as my substitute. Red oak is not as hard, registering lower on the Janka scale (about 200 lb/f less) so this might be one of the reasons ash was preferred. Though it is plenty hard enough, perhaps in real combat that 200 lb/f does make a difference. The vital distinction between red oak and ash is that of ductility (if that's the right word. Flexibility perhaps?). Ash remains supple while maintaining its strength. Red oak, by comparison, becomes somewhat brittle as it dries. For extended use, ash would be preferable as it's less likely to snap under sudden stresses. However given that this isn't going to undergo 'extended use' (we hope!) red oak should be perfectly suitable They ARE very similar woods, it's merely a matter of a few points' difference and it's not a critical enough difference to matter much in this specific context. A quick edit: Note that ash is a preferred wood for handles to all kinds of tools, which can definitely be expected to undergo sustained and extended use. That in itself is a pretty good signal. The thought also occurs to me that it's (IIRC) lighter than red oak as well; not significantly, but again in extended use, it could be light enough to make a difference. Thanks for the extra info Jeffrey. The flexibility of ash does make for better shock resistance - as you've noted with striking tool handles. Had I not gone with red oak, my next choice would have been hickory which is another striking tool handle favorite. It is extremely shock resistant, and harder than both red oak and ash. Another wood that grows well around where I live, and a fireplace favorite of mine for years. Nothing crackles and burns quite like hickory. Yes of course...although red oak is not native to Germany either - ha! Over the course of my research I did come to find out that red oak was quite popular in Germany in the 17th century and grows well there. Apparently it was a very popular transplant from the new world in the 17th century. So much so, that the grove around Baden, Germany had grown to 450 acres by 1924, and apparently is still a popular tree today. I do love historical accuracy, and strive for it wherever possible, but as I stated in my initial post, I've justified a change here or there by telling myself that in the spirit of the old smiths/haftsmen, when a desired wood is unavailable or too expensive, you find a reasonable substitute. Though I have no way of knowing if this is accurate, I imagine that medieval folk were equally if not more practical and resourceful than we are today. You might also look at fruit woods which were used in the old country as well; cherry and pear. I bought an affordable piece of 2"x2"x 72" long cherry from Baird Bros. a few years back and cut the corners off with a table saw to make a pole for my guisarme. It looks like it's up in cost (almost $6/lf). You can buy ash poles, hexes and 2x2" from a lot of suppliers for $2-$3/lf. in the USA. Many deciduous woods look a lot like one another when they are stained or aged so that you can't see the natural unseasoned color. Ash is very similar to a lot of other woods. I have arrow shafts from Australia made out of something called Silver Wood, which was described as an "Ash" but was actually related to eucalyptus trees. It looks just like ash or white oak, until you cut or sand it, and then it smells like menthol/vicks. My point being, that if it is just a show piece and you aren't going to swing it around, the brittleness of some woods won't be a factor and may look nearly identical in density and grain to other woods that would have been used. Hickory would probably make a nearly indestructable polearm shaft. It is quite difficult to cut and work though because it is so hard. It is also a bit heavier than ash (and, of course, ahistorical as mentioned already). It is great for making bows out of too (my favourite bow wood). Ash is the "default" polearm wood for a reason I think - it is a nice compromise between strength, weight and ease of working. Several years ago I managed to cause a weird sort of partial "delamination" failure along one of the dark grain lines in an ash longsword waster by hitting it very hard against a wooden pell. However it failed safely: it didn't snap nor did it come apart completely, and I was able to repair it (I still use it today, abeit with less force). 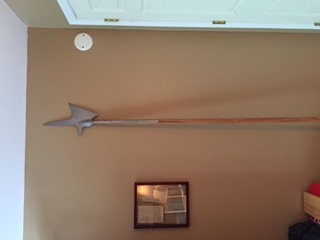 But my 6-foot ash spear has survived years of abuse without any sign of failure. 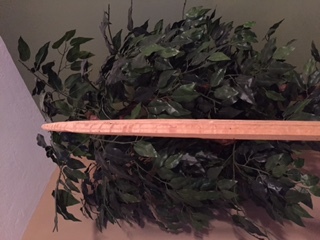 Maple makes nice staves; it has similar properties to ash, but like hickory it is ahistorical. Cherry wood is supposed to be good for bowmaking, so if you could get a big enough piece it would probably also work for polearms, but as noted by others, it is pretty expensive. I've heard it is also very suceptible to woodboring insects (which would match my experience with plum wood). I would love to make a staff or polearm of purpleheart wood one day - completely ahistorical, but what a wonderful wood! Strong, heavy and an incredible colour. But it is expensive, and I think the trees it comes from are under pressure through over-harvesting - I really don't want them to go extinct. I haven't used Austrailan mountain ash (the eucalyptus-ish wood I think) but I've had great results with some other wood that was probably Austrailan gum of some sort. It a pinkish red wood that goes a rich red brown once oiled. It was used to make pickaxe-handles, but we made walking staves out of them. Whatever it is, it is even tougher than hickory! I wish I could find long enough pieces of it to make polearms. Finally, I haven't tried them, but there are some very hard pines (yes, pine!) from Europe (and probably elsewhere), which I've read were actually used historically in lieu of Ash. Probably grown in cold climates, because I've read that makes the wood denser. I've handled (but not worked with) something called "stone pine" which lived up to its name in density and hardness - that would probably work well. So for a display-only polearm, a staff of carefully chosen pine is probably actually not a bad choice. 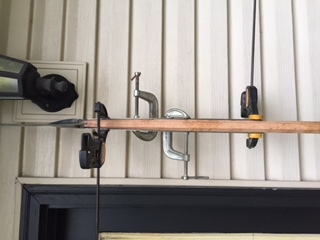 I have a hickory wood longbow too - and it is just flawless. Very smooth, very strong. I was looking at a purpleheart board at a local wood shop a few months back and it is beautiful. Though it's so hard that it's tough on saw blades - you essentially friction burn through it rather than cut it. Again, giving that I live historical reconstruction as much as possible, ash is my preferred wood, but I don't like buying the ash dowels online as I've heard too many stories about warping or poor grain patterns, and it's difficult to find a local seller that will carry and sell in small quantities. This project has spurred me on to research local sawmills to see what they might have. Until then, I'll be sticking with ash wheelbarrow handles for smaller polearms and probably red or white oak for longer ones...although hickory does sound like a fantastic option now that we've had that discussion!